Late night services will run the two weekends before Christmas and on New Year’s Eve. 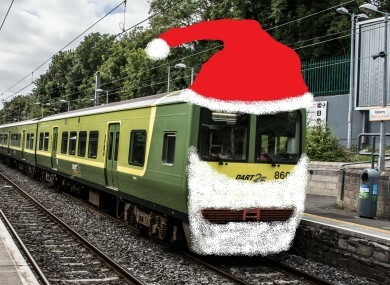 GOOD NEWS IF you live in the Dublin, Maynooth or Dundalk areas and have a lot of festive parties to go to – there will be trains late at night to take you home. If the train is your preferred mode of transport, you’ll be delighted to know that the DART and Dundalk and Maynooth line commuter services will run after midnight at weekends in the run up to Christmas starting from tonight. They will also run late after Dubln’s New Year’s Eve celebrations. Fares will be charged at the normal rates and all weekly, monthly and annual season tickets re valid on the late night services. The company said all of these services will have security personnel on board to ensure customer safety. Email “Late night Dublin trains will take you home from your Christmas parties”. Feedback on “Late night Dublin trains will take you home from your Christmas parties”.